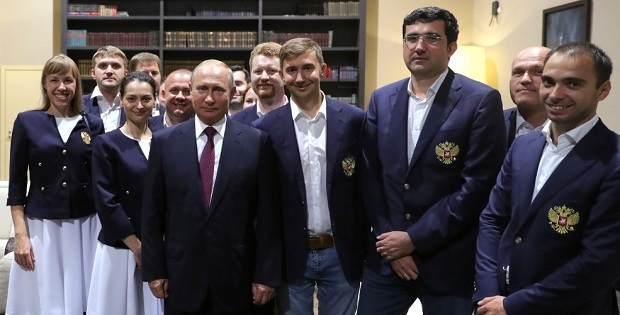 Russian President Vladimir Putin met with members of Russian national chess teams who are currently training in Sochi ahead of the Chess Olympiad. Taking part in the meeting were members of the men’s team Vladimir Kramnik, Sergei Karjakin, Ian Nepomniachtchi, Dmitry Jakovenko and Nikita Vityugov; while Alexandra Kosteniuk, Alexandra Goryachkina, Natalia Pogonina, Valentina Gunina and Olga Girya represented the women’s team. President of the Russian Chess Federation Andrei Filatov also attended the meeting.